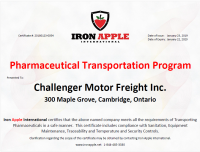 Our Pharma division offers guaranteed temperature protection for your freight. We ensure your freight arrives on time and at the correct temperature. Remote reefer temperature monitoring notifies us of any temperature discrepancies and allows us to make remote adjustments. Two way satellite communication; TracKing temperature monitoring for temperature excursions, alarm events plus GPS tracking.